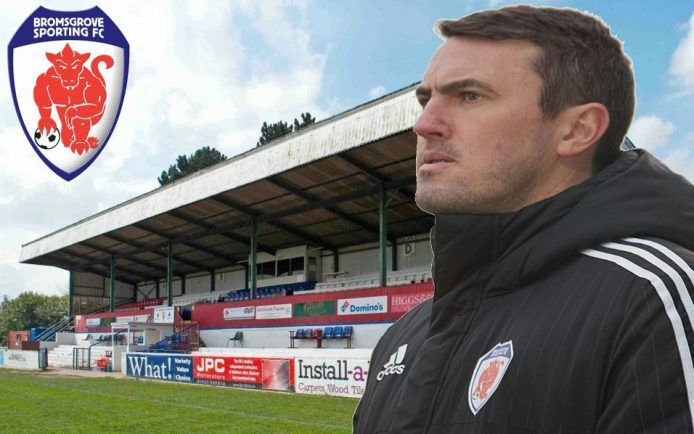 PAUL SMITH has urged his Bromsgrove Sporting players to keep their feet on the ground ahead of Saturday’s FA Cup tie at Rugby Town following their blistering start to the new Midland League Division One campaign. Sporting travel to Butlin Road for a preliminary round clash against their Northern Premier First Division South counterparts on the back of impressive league victories over Southam United and Littleton. Following a comfortable 3-0 win over Heath Hayes in the FA Cup extra preliminary round a fortnight ago, the Rouslers got their league season off to the perfect start on Saturday as they strolled to a 3-0 victory over United at the Victoria Ground. Goals from Chris Lloyd, Ahmed Ali and Tony Clarke secured the win before Sporting picked up an impressive 4-0 win away at Littleton on Wednesday night thanks to goals from Luke Edwards, Robbie Bunn, Chris Conway and Sean Brain. After drawing their opening two games of last season, Sporting have enjoyed a total turnaround in fortunes and sit atop the Division One table with a 100 per cent record and yet to concede a goal. Despite what could be described as the perfect start for the Rouslers, Smith told the Standard it’s important his players maintain their focus and do not take their feet off the gas. “Our results during pre-season got people looking at us and we’ve got off to a brilliant start in the league but the squad needs to remain grounded,” he said. “They need to ignore all the hype and I am confident that if the group remain tight, they will win games. “I was pleased with the performance against Southam as it was one of those games where we wanted a winning start. “We were head and shoulders better than them and I was always confident we’d find the back of the net as we’ve got goalscorers in this squad now. “I was over the moon with the display at Littleton because we had five players missing but the result is a real testament to the squad. “I’ve been shuffling the pack a little to keep the squad fresh and the togetherness in this group is second to none. “We’ve got nothing to lose on Saturday as we’re underdogs. However, we’ve got to give Rugby some respect but I am confident we can go over there and get a result. Ahead of Saturday’s game, Smith will be without Craig Jones, Joe Haines, Sam Wills and Nathan Walker, all of whom are away on holiday while Keenan Meakin-Richards remains suspended. Chris Lloyd is to make a return to the squad as does experienced goalkeeper Neil Leech who will be on the bench.